Only one person could have written this book. Thankfully, she did. The first Muslim woman and the first American Muslim to join the U.S. government Counter-Terrorism Center, Farhana Qazi, a Pakistani-American counterterrorism expert and policy analyst, has traveled the globe interviewing Muslim women extremists, speaking with would-be suicide bombers and jihadists and their families. 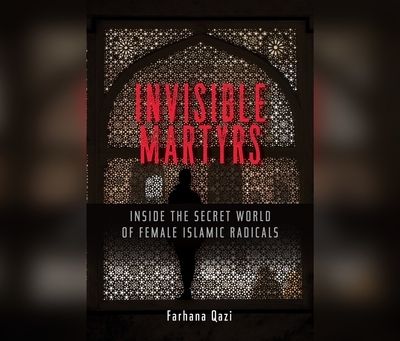 Their stories, and her understanding of them, fill the pages of Invisible Martyrs: Inside the Secret World of Female Islamic Radicals, an extraordinary analysis of female Islamist terrorists and the forces that drive them to extremism – not only in the Muslim world, but in the West as well. Often lyrically written and deeply personal, Qazi gives us a narrative that manages to be at once damning and compassionate, rich with insights that are as frightening as they are hopeful. And understanding the threat of women terrorists has never been more critical. Not only are more women joining jihadist groups, thanks in large part to internet recruiters and the outreach of ISIS operatives, but women, Qazi reports, can be even more destructive than men. Not only are they less conspicuous, thanks in part to burqas and other body-coverings, but "on average," she writes, women have "killed four times more people than male operatives." Moreover, the phenomenon is no longer limited to the war zones of the Middle East, Southeast Asia and North Africa. Tashfeen Malik became the first female Islamist terrorist to hit the United States when she and her husband Syed Farook killed 14 people and injured 22 at a 2015 San Bernardino Christmas party. It is unlikely that she will be the last. Qazi takes the fight against Islamic extremism personally. She started work at the Counterterrorism Center on Oct. 12, 2000, the day al-Qaida bombed the USS Cole. And yet, as a Muslim American working to fight Islamist terrorism, she was received with skepticism by her own Muslim community. For many Muslims in the West, it is exactly this conflict that leads them to extremism and hatred. Yet in Qazi's case, reconciling the two worlds strengthened both her patriotism and her commitment to the moderate Islam she believes can help end Islamic violence and terror. "I discovered that some viewed violence as a weapon of choice. They believed in the radical interpretations of Islam. These women joined extremist groups to give purpose to their lives and effect change: to rewrite the future, to say I am within the boundaries set by men, to cleanse an unwanted past, to fall into favor with God, to cast away something broken or bruised or scraped, to push beyond the limits of their gender, to find a like-minded lover, or to experience the connection that a woman feels when she joins a sisterhood." "dictated by a patriarchy of irrational and ignorant men, many of whom support the radical interpretation of Islam – the barbarism, the beastly action, and a culture of humiliation and shame narrated by violent extremists. These same men prey on vulnerable women, who are misguided, misinformed, and mistaken, incapable of differentiating the universal values of love that the Quran promotes from the teachings of corrupt, crooked men with blood on their hands." Nonetheless, Qazi in no way holds these women blameless, nor does she suggest that they become jihadists simply because they are corrupted by evil, conspiratorial men. Each girl, each woman, is responsible for her own choice, whatever her influences. Many choose violence as a way to avenge the loss of a husband, a child, or the honor of their culture. "The primary individual motivation for women," Qazi writes, "is personal: the protection of family, community and country in order to bring about meaningful change to conflict." Qazi explores the stories of multiple women, from Rania Ibrahim, who was 15 years old in 2008 when her aunt and mother – both al-Qaida members – strapped her into a suicide vest in Baghdad, to the three Sudanese- and Somali-American girls from Denver, Colorado, apprehended in 2014 as they tried to reach the Islamic State. The Denver teens' tale is a particularly cautionary one. Like so many others in the West, they had been radicalized, not in their local mosques, but online, despite coming from fully assimilated families – in fact, it was the Sudanese father, Assad Ibrahim, who alerted the FBI to the girls' disappearance. At a community gathering, Qazi writes, some parents expressed concern about their children's online activities, and whether they should be more closely monitored. Yet one father wondered, by contrast, whether being under "too much parental control and leading isolated lives, with only three places to go – school, the mosque, and their home – compelled the girls to seek freedom online." Indeed, Qazi notes that many Muslim girls from "ultraconservative households" specifically seek out friends online "to escape their overbearing families." Online communities offer kinship, a place to belong, and "the need to belong is exacerbated by the social isolation that Muslim girls and women often feel when their mobility is limited...Violent extremism is their new tribe, offering females a group to be a part of." This is also true of converts, who can be especially vulnerable to Islamist suitors, recruiters for terrorist groups who prey on naïve and largely uninformed young women, promising them love and happiness if they only give themselves to Allah. Shannon Maureen Conley, another Denver teen, converted to Islam and also was arrested en route to the Caliphate in 2014 after falling in love with an ISIS recruiter. In telling these women's stories, Qazi emphasizes not only the extent of the problem of women terrorists, but the urgency of recognizing how challenging and dangerous it has become. Today, she writes, "radical women present a real and ongoing threat." The book has its flaws. Understandably, but no less frustratingly, Qazi resorts often to clichéd defensiveness, insisting repeatedly that "Islam is a religion of peace" and that extremists have perverted its true meaning – an argument that not only has grown tired, but which extremists themselves would deny just as vigorously. And because the arguments are both based on interpretations of vague and faith-based texts, either one is equally true or false. And she spends much of the last chapters exalting God, a gesture that is not only irrelevant to the book's purpose but which weakens it as a counterterrorism analysis of a real and urgent threat. Such references are not only distracting, but annoying, as if the reader is being proselytized. Still, perhaps Qazi has a purpose and a point in this. She believes the Muslim community is on the front lines, and the parents and communities are the best equipped to prevent radicalization, to signal it when it appears, and to stop it when it becomes violent. The best way to do this might be by promoting her interpretation of Islam: empowering of women, based in charity and community, and in rejection of violence. Some might argue that such an Islam does not exist. Right or wrong, the argument misses the more critical point: that Muslim women across the globe have become a force of "invisible martyrs" that must be stopped. Teaching them from the earliest age that they can be good Muslims, good women, and still remain both empowered and peaceful may well be the best weapon to do just that. Qazi's background and expertise suggest that it is well worth considering. It would not be easy to do, as she herself acknowledges. But lives are on the line.